Province of British Columbia / CC BY-NC-ND 2.0 Prime Minister Justin Trudeau speaks at Globe 2016 on March 2. 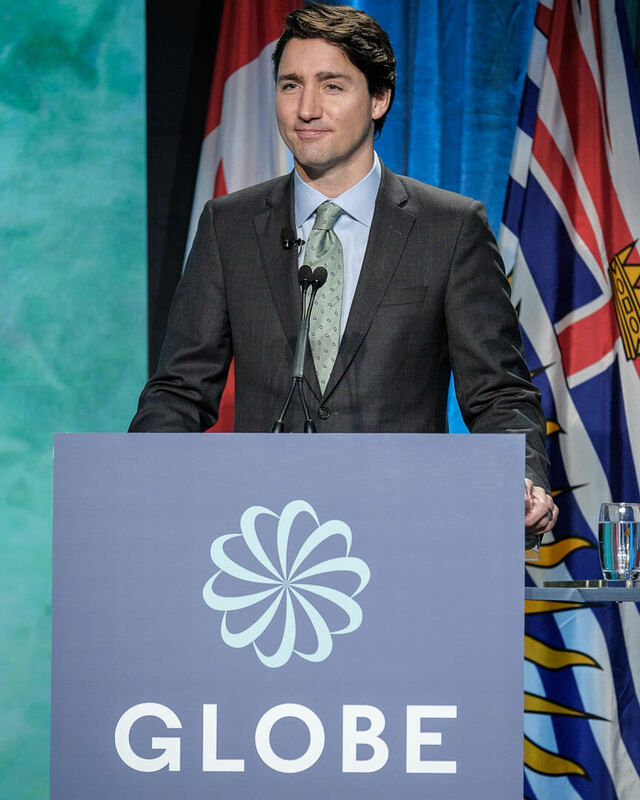 At the opening plenary of Globe 2016, a biannual sustainable business conference in Vancouver, Prime Minister Justin Trudeau delivered a speech about the vital project of transitioning Canada and the world to a low-carbon economy. He did so, on the face of it, because this is one of those things elected officials do. There is a big confab on a pressing issue high on the public agenda, so elected officials show up to signal support and demonstrate engagement. Routine gig. Trudeau’s Globe speech, which was focused on flinging the false choice between economic and environmental health into the dustbin of history, quickly dissipated amid the national media churn. A few choice lines were sprinkled over the ongoing coverage of climate policy and first ministers’ meetings and whatever Saskatchewan premier Brad Wall said somewhere else today. It was headline news in a routine sort of way. Trudeau’s speech contained only a couple of new spending commitments and was not particularly controversial, even though the Canadian Press attempted to frame a line that went “The choice between pipelines and wind turbines is a false one” as a signal of some minor shift in the larger national discussion about energy policy. In the normal course of events, though, it’s likely few Canadians noticed the speech, and it’s equally likely it will soon vanish entirely in the turbulent flow of news from the first ministers’ conference itself. That said, I thought it was a very good speech, and important in ways such routine speeches rarely are. But then I would say that, since—in the spirit of both full disclosure and full-on humblebragging—I helped write it. Nevertheless, Trudeau’s Globe speech actually matters quite a lot, and not just because of my direct connection to it. Here’s why: It was unimaginable even a year ago, not just to me but, I’d wager, to most of the people in attendance at the Globe conference, that the prime minister of Canada would show up to kick off a conference like this. Unimaginable. Almost fantastical. A possibly reckless daydream. Ten years can seem like forever in politics. And we had all inured ourselves, over those ten years of Stephen Harper’s reign, to the idea that this collective project that we were all working on would succeed, if it did, despite the federal government. And probably most provincial governments. And many of the predominant power structures in the country, if not the whole world. We understood we were outside, looking in. Understand: conferences like this Globe series are deeply idealistic. There’s shoptalk, of course—wonky shoptalk about energy and efficiency and emissions—but it revolves around a shared goal not of another banner year for Industry X but of fixing what is widely agreed at such conferences to be the most important problem humanity will face in any of our lifetimes. I wrote those lines in 2006. And not a thing I’ve seen in the last ten years has shaken my sense of its basic truth. I didn’t know what I even meant by it then, and it may strike some as odd that it never led me to a barricade or a march. This is not necessarily because I disagree with those actions but because once I’d properly ascertained the scale of the problem, I couldn’t see how protest marches led to where I thought we needed to go. Not on their own, anyway. I’d stumbled into a conversation about how to rebuild the world from the ground up. Never mind energy production, what did it mean for a department store or a bank or a furniture manufacturer or a logging company or a suburban neighbourhood to be part of this universal climate solution that had come to be known, a touch awkwardly, as sustainability? I didn’t know, and in my search for answers I found myself drawn to wonky conferences peopled in the main by mid-level managers, entrepreneurs touting gee-whiz gizmos, directors of NGOs, assistant deputy ministers. Previous Globe conferences were headlined by local political dignitaries (the mayor, later the premier) and the sub-C-suite executives of random multinationals. VIPs, sure, but by a generous definition of V. This all wasn’t for nothing, but it certainly wasn’t the centre of too many people’s gravity. At Globe’s opening plenary yesterday morning, familiar faces from panel discussions and roundtables at events like this one over the years hurried in as part of a bustling entourage. They chatted amiably with the cabinet ministers who now employ them. A vast arsenal of TV cameras had assembled at the centre of the ballroom, and a handful broke away in a rush when the premier of Ontario strolled in. This was—I can’t possibly overstate this—nothing like the business as usual I’d come to know at a sustainable business conference. This Vancouver ballroom, this talk of energy transitions and carbon budgets—somehow, finally, this was now the inside. The sustainability geeks were the government, or part of it, anyway. It was our prom, and to have such a conference graced with a prime minister’s speech felt valedictory. And if it also felt like a long time in coming, it felt no less powerful for that. In his speech, the Trudeau placed this wonky sustainability project at the top of Canada’s public policy agenda, as many of us had long argued it should be but had perhaps grown used to thinking it might never be. The business being discussed in the days to come, he assured us, was a “mainstream” business, and we finally had “a real partner” in Ottawa. At the press conference afterward, the general thrust of the questions rapidly redirected the prime minister’s lofty talk into the usual political morass of unsettled scores and competing interests. Questions about pipelines and related issues and the presumed controversy over such things outnumbered questions about anything else by a ratio of at least two to one. I’ll wade further into that morass in dispatches from Globe in the days to come. Both because it’s a necessary slog and because, come to think of it, sustainability conferences tend to be better than average at tackling that kind of complexity and contradiction. For now, though, I want to leave it with Justin Trudeau in the glare of dozens of cameras on a Vancouver stage, where the business of solving climate change finally became a national project.